MURK FAIL - Art Sabotage original! An early SIN ALLEY collaborative project, perpetrated by numerous alternative/underground lowlife scumbags in attendance at the San Diego Comic Con, many moons ago...in those days, some innocent article of popular print culture was typically passed from artist to artist & ritually altered, attacked, & defaced, transforming it into a bizarre masterpiece of utterly shocking filth and revolting weirdness. Highly amusing! Copies were clandestinely printed and sold to the RIGHT people "under the table." Not a copy, this is the "original," where the artists have inked their "corrections" over generous globs of white-out. 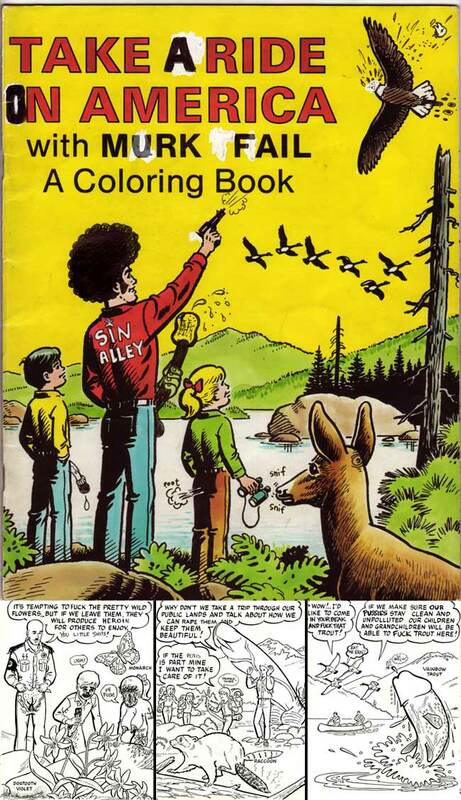 To sweeten the deal, I am including an unmarked copy of the original coloring book, plus the ART SABOTAGE CD-R, which features crisp jpeg scans of MURK FAIL & several other SIN ALLEY art sabotage projects. MURK FAIL is 28 pages, inks and white-out on printed paper. Please include some sort of statement that indicates your age as being over 21 years, and that you are not adverse to viewing adult oriented materials.